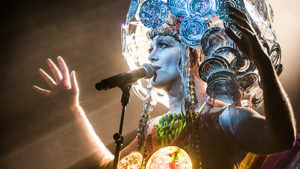 The D.C. premiere of this live vocal and theatrical presentation offers a radical, queer reading of American history with fabulous entertainer Taylor Mac and local performers. This hit show from drag artist Taylor Mac—the genre-defying winner of a 2017 MacArthur “Genius” Grant, recipient of the 2017 Edward M. Kennedy Prize for Drama, and a finalist for the 2017 Pulitzer Prize for Drama—uses songs of the time to chronicle our country from its founding in 1776 to today. Years in development, the show was originally performed in 2016 as a one-time, 24-hour event that made the New York Times annual list of Best Performances, Theater, and Music. This condensed version is a highly immersive and outrageously entertaining crash course in the 240 years (and counting) of American culture and dysfunction. Highlighting various musical styles and artistic voices ranging from murder ballads to disco, Walt Whitman to David Bowie, this night is “startlingly unique… a must-see for anyone who wants to see a kinder, gentler society” (Huffington Post).